One of the things I am struggling with this week is drinking all the water I need to flush the crap-ola out of me that I am burning off. There are only 1 of 2 ways your body is going to flush the fat and in order for your body to do that job efficiently is to pee ... a lot! I work on the phones and frequent breaks just are not something that are consistant to performing well at my job. Yesterday I ate my grilled chicken sandwich while talking to a client. I need to take time though to go fill up my water bottle so I can get the fluids I need. It's not like my work won't let me get up to get a drink or anything, I just get so involved with the projects I am working on I find myself seldom getting up. I need to balance my work day out better again. Before I was tkaing every available break and drinking so much water I had to pee every 15 min. it seemed like. Also, on my scheduled break times I was doing some short but intense cardio. The interuption was a much needed way to break up my day. One of the ways I like to get all the water I need down is my Crystal Light packets. I have shown these before but there seems to be a new flavor avery couple of months. I love these. Actually the WalMart knock offs are not to bad either. The grape is sweet like real sugar filled Kool-Aid and only like 5 or 10 calories. I am almost 100% off soda because of them. I think I have had like 3 diet cokes in the past couple of months. I want to know your best little tip. What is something you do or use to help overcome the little struggles that slow your progress? I used the crystal light and Walmart knock-offs too. I also buy bottled water and every morning I get my 6 mandatory bottles and put them on the nightstand so I can keep track of what I'm drinking. Once those 6 are gone, the rest is just icing on the cake. Having them in front of me reminds me to keep drinking. Drinking room temperature water helps me get it down. Very cold water is difficult for me to drink in large quantities. Drinking a lot of water is tough, at first. You pee every time you turn around. But your body does adjust, inn time. And you will find yourself running to the toilet less often. Just give it a little time. I know that can be difficult when you are at work. I recommend to my clients to drink a bottle (16oz) with each meal and snack. This way, since they should be eating every 3-4 hours, they should be getting in at least 8-10 glasses of water each day! I think it makes it a little more manageable. Also, to keep a water bottle with you at all times... mine is usually stocked with lots of ICE since I prefer mine cold! In the olden days when I was working, I set a reminder on my calendar to pop up at my break and lunch times. Otherwise, I just kept on working and rarely took a break. Easy for a computer guy! I may have to try Crystal Light or something like that again....it's been a long time since I had any but it might be nice for a little variety! WTG on no soda! I stopped about a year ago with only a few here and there...and I really don't like it like I used to when I do have it! I must say, I am soooo lucky that drinking the water has never been a problem for me. I just drink a LOT so getting the regular water usually isn't to tough. I like the idea of drinking about 30 minutes before each meal. I read it someplace as a suggestion to help "fill up" before you eat. 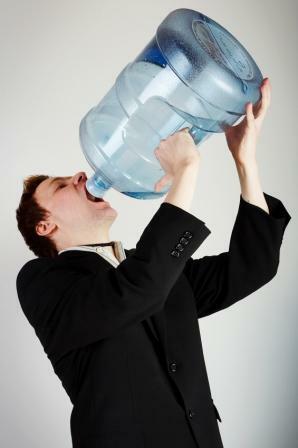 I drink about 25oz of water first thing in the morning when I get up. I feel like it hydrates me for my day. I drink a 32 oz Poweraid Zero (GRAPE!) everytime I work out. Those are my FAV!! Zero Calories and they are TASTY! I was drinking a lot of Crystal Light but I got really burned out of every flavor. So now its plain water unless I work out and then I get to indulge on the Poweraid Zero. I wish I had some great advice on the water for you, but I don't. I recently had kidney stone surgery and now I have to drink 8-10 oz. of water every stinking hour. It is a nightmare, I'm always in the bathroom! The only trick I do faithfully is drink about 12-16 ounces of water every morning before my morning coffee. That sets the tone for the day, and my coffee is my reward. Water is so important--I used to drink a lot, but now I'm sloshing around. I do try to drink at least two 12-16 oz. glasses of water with each meal, which helps flush things out, too. I don't work, so I have access to the bathroom any time I want. I would be even more miserable if I had to do this in an office. My tip is: Not waiting until evening to cram it all in (that makes you sick, and makes you not want to drink any the next day. Also if I have water bottles laid out on your desk ready for you for the day you are sure to get your water in. I drink herbal tea (non caffeinated) as well as water with lemon throughout the day. Herbal tea is an acquired taste so have a few cups before you decide if you like it. As always good luck.